The Eerste Divisie (Dutch pronunciation: [ˈeːrstə diˈvizi], English: First Division) is the second-highest tier of football in the Netherlands. It is linked with the top-level Eredivisie and with the third-level Tweede Divisie via promotion/relegation systems. It is also known as the Keuken Kampioen Divisie due to sponsorship, while previously it was known as Jupiler League for the same reason. 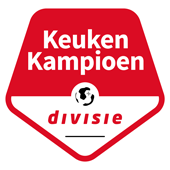 The Eerste Divisie consists of 20 clubs, who play each other in a double round-robin league, with each club playing the other club home and away. Each club plays every other club once in the first half of the season before the league takes a winter break around the Christmas and New Year's holiday season. The second half of the season sees the same fixtures as the first half, with the stadiums changed, although the two halves are not played in the same order. The club with the best record in the "first period" of the season (after 8 rounds). The club with the best record in the "second period" of the season (rounds 9–16). The club with the best record in the "third period" of the season (rounds 17–24). The club with the best record in the "fourth period" of the season (rounds 25–32). The two remaining spots are filled at the season's end by the highest-placed clubs that have not already earned automatic promotion or qualified for the Nacompetitie. If the club that wins a period has qualified for the Nacompetitie by winning a previous period, its place is filled by the next-best club in that period that has not already qualified. Usually, the clubs that qualify for the Nacompetitie turn out to be the 2nd- through 9th-placed clubs in the final table. Clubs in the Nacompetitie face each other in a knock-out system with the numbers 16 and 17 of the Eredivisie for two places in next season's Eredivisie. Between seasons 1971/1972 and 2007/2009 teams could not relegate from the Eerste Divisie. From the 2009/2010 season onwards, one team has been relegated from the Eerste Divisie to the Hoofdklasse (then the main amateur league of Dutch football). From the 2010/2011 to 2015/2016 seasons, the KNVB introduced a third and highest amateur tier called Topklasse, and Hoofdklasse clubs have been able to get promoted to that new division. Before the 2008/2009 season, Hoofdklasse clubs could promote by obtaining a professional licence. However, only a club going bankrupt or losing their license could result in clubs leaving professional football. The last clubs leaving professional football in that way were FC Wageningen and VCV Zeeland in 1992, and more recently HFC Haarlem and RBC Roosendaal, who went bankrupt in January 2010 and June 2011 respectively. The most recent additions to the league were AGOVV Apeldoorn in 2003 and FC Omniworld in 2005, expanding the league to 19 and later 20 clubs. However, for the 2010/11 season, the league returned to 18 clubs, as HFC Haarlem went bankrupt and FC Oss were relegated to the newly formed Topklasse. The 2012/13 season ended with 16 teams after AGOVV and BV Veendam went bankrupt. Four teams have been added to bring the division back up to 20 teams in 2013. Achilles '29 has been promoted from the Topklasse with the reserve teams of Ajax, FC Twente and PSV being added as well. Since the 2016/2017 season there is automatic relegation to the third-tier, semi-professional Tweede Divisie. Clubs in the Tweede Divisie had to announce in mid-season if they want to be eligible for promotion. Only if one of those clubs won the Tweede Divisie championship is a team relegated from the Eerste Divisie. Clubs with larger fanbases suffered relegation in the 2000s, with Roda JC setting the Eerste Divisie attendance record at 16,150 during their home game against N.E.C. in the 2014/15 season. NAC Breda bettered it a season later in their home match against Go Ahead Eagles, which had an attendance of 17800 people. 2 Fortuna 54 merged with Sittardia to form FSC, later renamed Fortuna Sittard. 4 Schiedamse Voetbal Vereniging (SVV) and Drecht Steden 79 (DS'79) merged into SVV/Dordecht'90. Now FC Dordrecht. period champion Round 1 if it is a low ranked club, Semi finals if it is a highly ranked club. Eredivisie or Eerste Divisie depends on whether the team wins the pools final. highly ranked clubs Playoff Semi finals Eredivisie or Eerste Divisie depends on whether the team wins the pools final. Lower ranked club Playoff Round 1 Eredivisie or Eerste Divisie depends on whether the team wins the pools final. aA Jong (reserve) team can become the champion. But they can't promote, the direct promotion or the playoff ticket will then be giving to the next non Jong team in the end table. Round 1 will be played against lower ranked teams, in both pools (Pool A or Pool B). Winner Round 1 will compete in the Semi finals against the number 17th or 16th from the Eredivisie. Both pools have their own finals, the finals are played against the winner of Match A and Match B of the semi finals. The winner of the finals will go to the Eredivisie. ^ "Eerste Divisie wordt Keuken Kampioen Divisie". Retrieved 29 June 2018.